Improve your cardiovascular health and enjoy low-impact indoor workouts using the ProForm Sport 5.0 treadmill. The 2.0 CHP motor offers a maximum speed of 16kph (10mph) and an incline range of 0-10% to let you increase your workout intensity and calorie burn. The treadmill is easy on your joints thanks to the ProShox cushioning system and features a 3-window LCD display that provides feedback on key workout data including time, speed, distance, incline, calories and pulse. Get into shape faster and challenge yourself using the 17 motivating programmes with a manual option and 16 pre-set weight loss workouts. Get access to countless interactive workout possibilities on this treadmill as it is iFit® Bluetooth Smart (BLE) compatible (subscription is optional extra). Measure heart rate via the pulse grips or the wireless receiver which is compatible with all Bluetooth® Smart chest belts (not included). 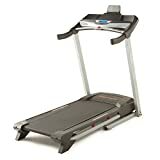 There is also a convenient tablet holder and a compatible music port for iPod®/mp3 player letting you listen to your favourite tunes when exercising, and the treadmill has a Space Saver- design for practical and easy storage. This entry was posted in Fitness Products and tagged Proform, Sport, Treadmill by Summer 365. Bookmark the permalink.